Two years ago I began Café Unknown, a series of articles on Portland, it place, its history and its past in the present. Actually, I had no idea what it would be about. Advances in spell-check technology encouraged me to revisit my moribund writing. I knew that Portland and history would be major themes, but initially I pictured alternating between Portland and elsewhere to build upon contrasts to define what was unique to our city. There may still be articles about “everything else” in the future, but they will be separate, linked to Café Unknown rather of part of it. The Portland and history formula on the site is pretty well established. On this, the second anniversary of Café Unknown, I decided to update some of the earlier stories where new information or pictures have become available. told he story of Portland’s first skyscraper and the spectacular collapse of its south east side in 1912 . Recently I obtained this picture of the interior of the theater (which was located to the rear of the main building). 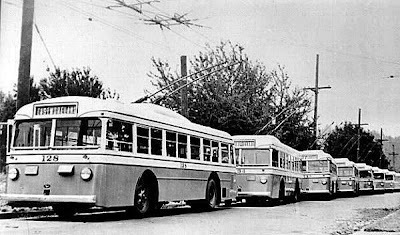 From the same month was “Off Line Too Soon,” about Portland’s electric bus or “trolley coach” network, which ran from 1937 to 1958. 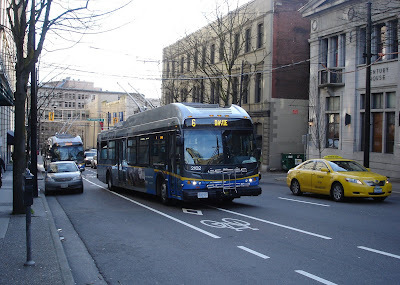 Since the article, Vancouver BC has received their latest order of trolley buses, their first for the twenty first century. Had Portland’s network survived, the look of the Portland’s inner bus routes today might be similar. For close-in corridor streets without need (or the desire) of higher density re-development (Hawthorne? Belmont? Twenty Third?) the trolley bus could still have a place, as a much less expensive version of the Portland Streetcar, with all the same clean, quiet and green attributes. 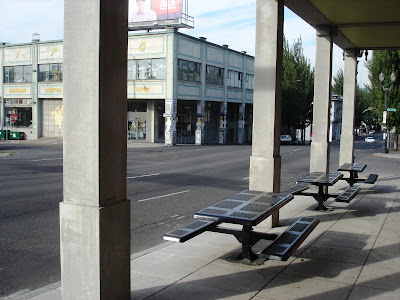 told the story of the “Arcades” those buildings on East Burnside which hang over the sidewalk, due to a late 1920s era street widening project. 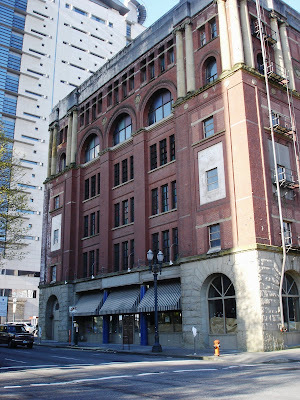 I opined that, as a unique local architectural vernacular, perhaps new arcaded buildings could be built on East Burnside. Behold, “ The Rocket” at 1111 East Burnside! It was designed and developed by architect Kevin Cavenaugh. As much as I would have liked have had a part in the reviving of the arcades, the ground already had been broken on building when “Hung Over” was written. 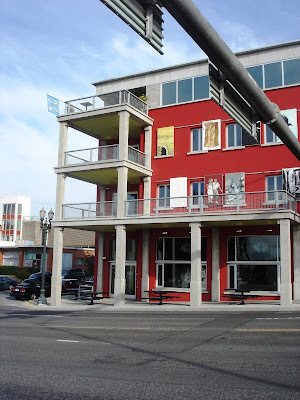 Portland Architecture has an article about this great addition to the streetscape. 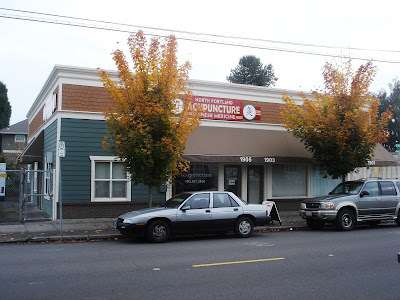 Also from August 2006 was "1901 Café Redux"
While researching the history old sign from the 1950s era "1901 Cafe" on N. Killingsworth that reappeared during a remodel, I stumbled on a sadder, more significant story; that of George T. and Kayo Mita. They operated the Fairview Market in the building from 1937 to 1942, after which they were taken to the Minidok Internment Camp, near Hunt Idaho along with thousands of other Japanese Americans. Kayo Mita died there shortly after arrival. The Fairview Market as it looks today. 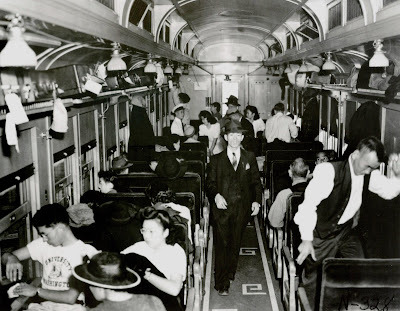 A picture taken in 1942, at Portland Oregon, of Japanese Americans on board a train. As a regular traveler on Amtrak’s Cascades between Portland and Seattle, I am struck by familiar flurry of activity before departure, the baggage above the chairs, and especially the guy in the University of Washington t-shirt, who looks as if he could step out of time and into today. The same elements can be seen hourly at Union Station. Only these people are being forcibly removed to an internment camp. 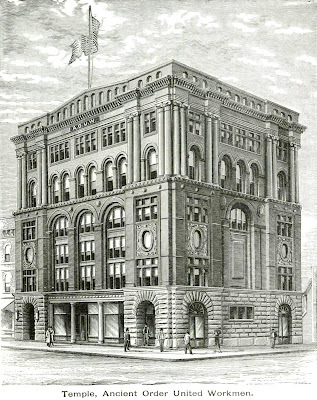 was a survey of Portland’s Richardson Romanesque inspired architecture, weighted towards surviving buildings (it also omitted one of the most impressive lost examples for a possible future article). One of my favorite buildings covered is the brooding Ancient Order of United Workmen’s Temple (1892) at SW Second and Taylor. 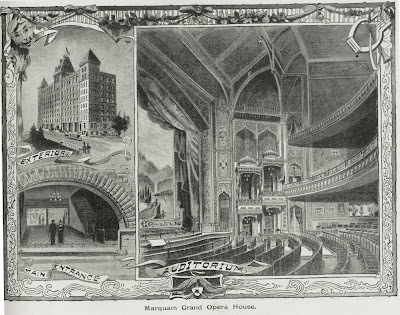 I recently obtained this 1895 view of the same building, with different upper arches (similar to the nearby Auditorium Building) on the fifth floor, and a cornice. Does it reflect changes or artistic license? In a post that shall remain nameless, I speculated on the nature of sports team curses. In sincere hope of being passed over, let us speak no more of these things. Elsewhere in sports- Mad Props (in the parlance of Jim Rome) to the Portland Beavers for their recent decision to keep their name which reaches back to 1905, the Pacific Coast League and the ballpark on Vaughn Street! Speaking of the Portland Beavers: Is there a better place anywhere to have a beer and watch baseball than the Widmer beer garden just beyond the foul line in right field at PGE Park? Safeco Field has nothing on it. was that I had no photograph of the Observatory at its height, with two levels. 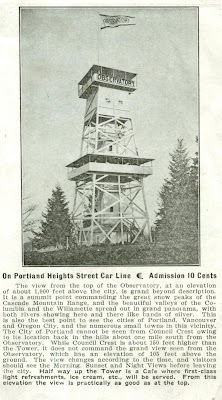 Below, from the back of a 1906 Portland Consolidated Railway Company map, is the tower in all its glory. It even had a restaurant on the lower level. At the end of “Dreamland”, I asked if there were any more of the “Pretty girls, Pretty girls everywhere. 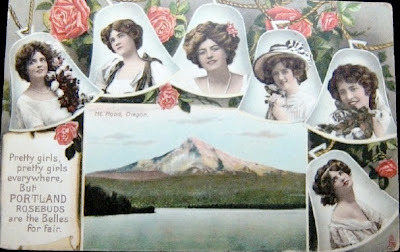 But the Portland Belles are claimed most fair” postcards that promoted local sights, besides those for Council Crest, the Portland and Multnomah Hotels and Lewis and Clark Exposition Forestry Building. Add to that list the Broadway Bridge, the Multnomah County Courthouse and the corner of Washington and Broadway streets as well as this variant (below) that sings praises of the “Portland Rosebuds” and Mt Hood. 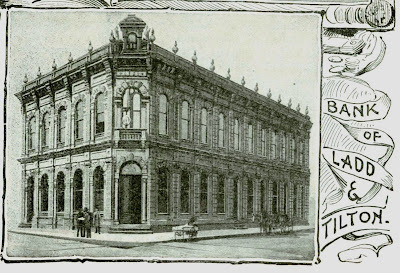 told the story of the Ladd and Tilton Bank that once stood on the corner of First and Stark, and how years after its demolition, its cast iron façade was appended to its near sister building, the Ladd and Bush Bank in Salem. 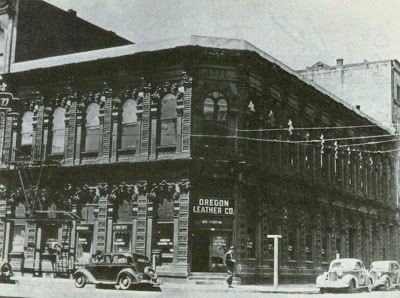 Since then I have found two more pictures of the building, one from the 1890s in its original configuration and one from the 1930s when it housed the Oregon Leather Company. Note that in the 1930s photograph, the finials that served as chimney caps had been removed (they must have been something to see in the winter). Also missing is the parapet with Neptune and Mercury on the roof above the entrance, which sheds some light on the mystery of their disappearance. 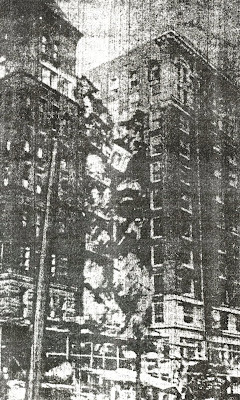 Whatever happened to the parapet, it was gone long before the building was demolished in 1954 when the remaining fixtures were saved by Eric Ladd. I asked what had happened to the collection of totem poles displayed at the Lewis & Clark Exposition in 1905. Nick Stewart wrote that they survive in Totem Hall at the Sitka National Historic Park visitor center in Alaska. But by then, I had found another group of totem poles, this time from the 1959 Oregon Centennial in North Portland. They too were missing. Again Nick Stewart was again able to trace two of the group; one carved by Chief Lelooska is now at New Zealand’s Christchurch International. Another was carved by noted Tlingit artist Amos Wallace. That pole and the others in the group’s locations are yet to be found. Can anyone help Nick and I? For all the totem poles passing through Portland it is a shame none of them seem to take root. 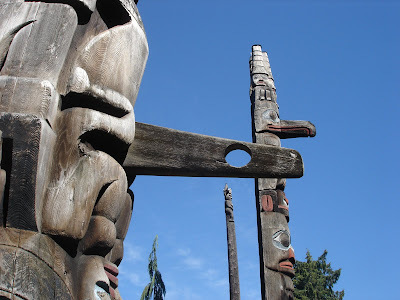 Northwest Oregon was outside the traditional totem pole carving area, but within the cultural and artistic traditions of the Native American’s of the Northwest Coast area. Other than the instillation near Ockley Green Middle School on the Yellow Max Line, there is little in the way of larger scale Native American public art in Portland. 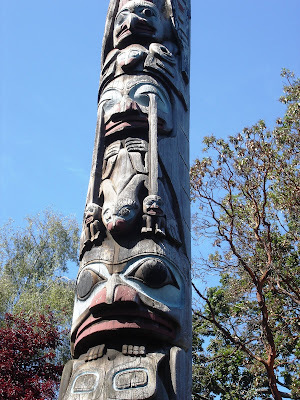 My favorite totem pole, from a recent visit to Victoria British Columbia’s Thunderbird Park. It tells the tale of an Old Sea Chief. At night his eyes would drop from his sockets and hang down to his waist. At meal times his friends would put his eyes back into the sockets and hold them there so that he could see to eat. The Old Sea Chief would eat seals whole, because he had no teeth. Then, after several hours, he would spit the bones out with great force. H.P. Lovecraft was not the first practitioner of the genre! 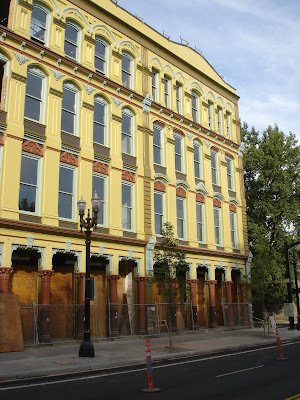 the history and restoration of the Bickel Block (1883) as part of the University of Oregon’s White Stag Building complex was covered. The Bickel Block, in high Victorian garb, nears completion. 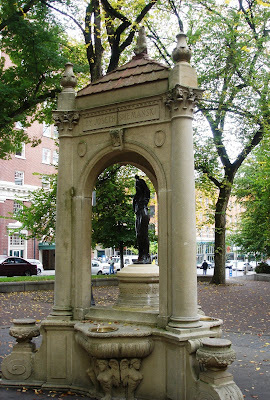 And finally, an article that never was would have told the story of the vandalism suffered by the Shemanski Fountain (“Rebecca at the Well”) in the South Park Blocks. The fountain, a gift from Polish immigrant Joseph Shemanski in 1926 was extensively damaged and the statue nearly torn off (It was removed for repairs, I thought it had been lost). No matter how I framed it, the article was too depressing. I had to give it up. Perhaps a security camera might be in order. Thanks everyone who has read, supported, spread the word or commented in this endeavor over the last two years, and especially to Jill, mon amour extraordinaire, who lives with my obscure obsessions every day. Just wanted to take this opportunity to thank you for all of your excellent work on this blog over the past few years. 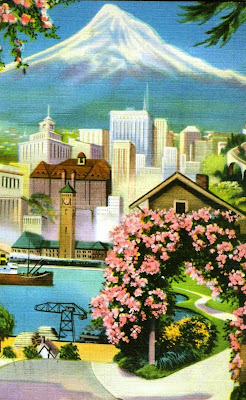 As a fifth generation Portlander who lives in Overlook, your posts have sometimes been very "close to home" and have given me such amazing historical information about the neighborhood and Portland in general. As you mentioned in your last post, the history of Portland is constantly barraged by developments, politics and the next best thing. It is very refreshing to have a place to reflect on the past art, architecture, geography and even how people thought about things in different times.